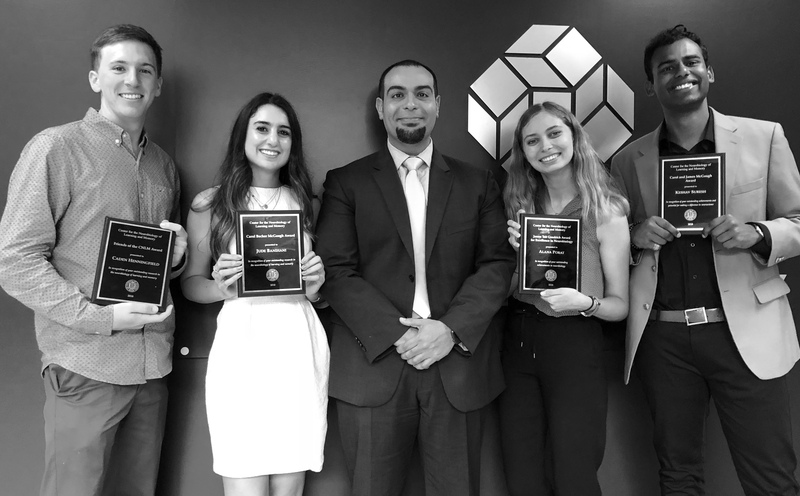 The 2018 award recipients included four undergraduate students and six graduate students studying neuroscience at UC Irvine. The ceremony featured brief elevator pitch-style talks from the recipients. Topics included stress, addiction, cognitive training, Alzheimer's disease, Huntington's disease and fundamental learning and memory. Three of the awards presented were established in the Ayala School of Biological Sciences and honor the contributions of Dr. James L McGaugh and the memory of Mrs. Carol Becker McGaugh, both of whom were integral to the founding and success of the Center for the Neurobiology of Learning and Memory. The Carol and James McGaugh Award was established this year in the Ayala School of Biological Sciences in memory of Mrs. Carol McGaugh and to honor Dr. James McGaugh. The award was established by daughter and son-in-law of Dr. and Mrs. McGaugh, Janice McGaugh Morrow and William Morrow. This year's recipient, Keshav Suresh is an undergraduate working in Professor Tallie Z. Baram's laboratory. Keshav impressed the audience by relating his research on maternal stress to the poverty he experienced in India during his childhood. The James Tait Goodrich Award for Excellence in Neurobiology in honor of Dr. James McGaugh was established this year in the Ayala School of Biological Sciences by Dr. James Tait Goodrich and Mrs. Judy L. Goodrich. Dr. Goodrich, who studied with Dr. McGaugh as an undergraduate student at UC Irvine established this award as a way to honor Dr. McGaugh and contribute to the UC Irvine community. This year's recipient of the James Tait Goodrich Award is Alana Porat, an undergraduate working with Dr. Karina Cramer. 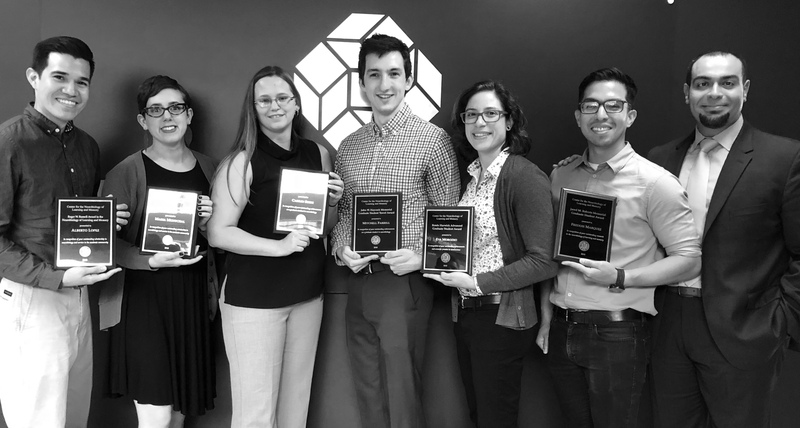 The Jared M. Roberts Memorial Graduate Student Travel Award was established last year by the family, friends and colleagues of Jared Roberts, who was a graduate student in Neurobiology and Behavior at UC Irvine. This year's recipient of the Jared M. Roberts Memorial Graduate Student Travel Award is Freddie Marquez, graduate student in Dr. Michael Yassa's laboratory. In his talk, Freddie described his work on trying to understand the early events that happen in the brain that might contribute to Alzheimer's disease. Descriptions of all of the awards can be found by clicking here. "Astrocytes as a Potential Player in Stress-Induced Brain Plasticity"
"The role of CREST in the Regulation of Memory-Associated Genes"
"The Impact of Microglia Upon Synaptic Pruning in the Auditory Brainstem"
"Exploration of a Virtual Environment Improves Hippocampal Cognition"
"Toward understanding the early mechanisms that contribute to Alzheimer’s disease"
"Alzheimer's Disease: It's all about the balance"
"Risky rewards: Brain mechanisms of risky decision making"
"Protein Balance in Huntington's Disease"
"Insights into the circuitry regulating cocaine relapse"
"Studying memory for real life-like events in the laboratory"
The annual awards of the CNLM are possible thanks to the generosity of our wonderful community of supporters including Dr. James McGaugh, Mrs. Janice McGaugh Morrow and Mr. William Morrow, Dr. James Tait Goodrich and Mrs. Judy Goodrich, Dr. Renée Harwick, the friends, family and colleagues of Dr. John Haycock, the friends, family and colleagues of Mr. Jared Roberts, the friends, family and colleagues of Dr. Roger Russell and the Friends of the CNLM. Thank you for making a difference in the careers of our young scholars.